The weather is uniform grey again in West Wales and the coast desolate and uninviting. This stretch of coast south of Aberystwyth was where the sad-eyed detective from the television series ‘Hinterland’ had his isolated mobile home. 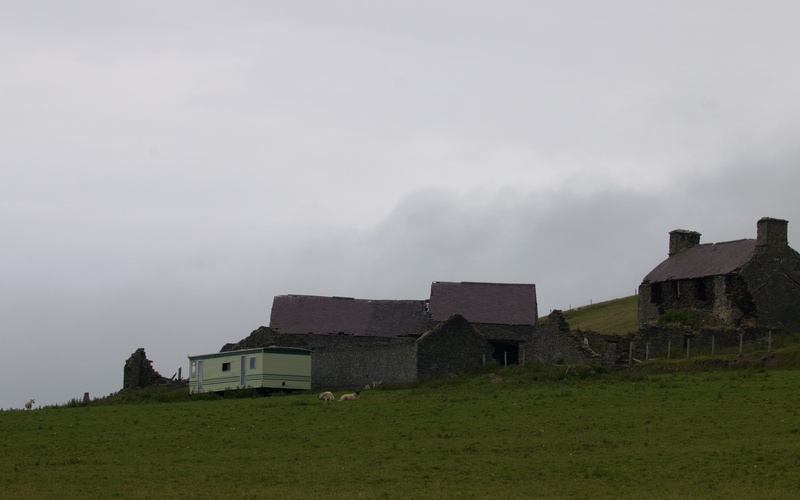 Beneath the long grass slope, the lively, lime green shoe-box looks out of place in front of the peaceful geometry of the dying and long-deserted, stone and slate farm. Hinterland on a bleak day. A family of choughs swings over in loud harmony, rising up and over the cliff on the the onshore wind, lifting the mood of the place. Each is colour-ringed and the family history, running back over many years of occupancy, carefully documented. 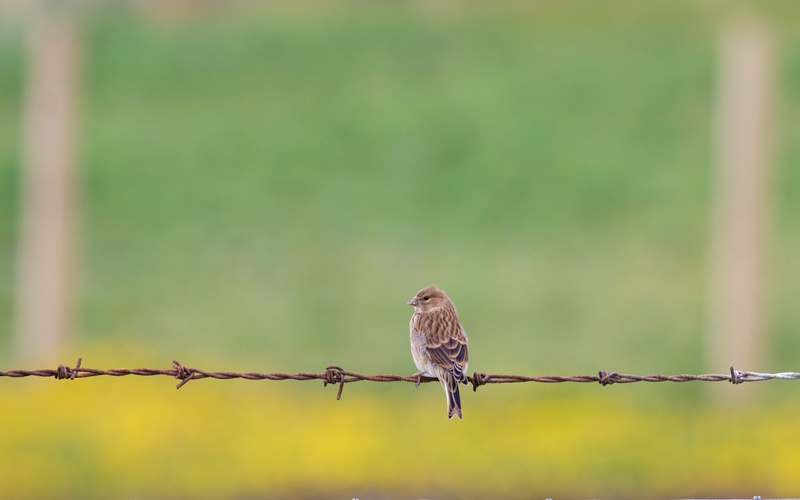 Linnets, smart against the bright yellow trefoil that carpet the thin strip between fence and cliff, up from the coastal scrub in pairs and watch us tramp by. Female linnet on a cliff edge fence. A kestrel has occupied a chough nest box down the way; we walk the cliff edge and Tony pops down to the nest-box on the cliff face to ring the large brood of five young. The male comes in with a vole or shrew. Prey is plentiful this year and the entire brood should fledge. 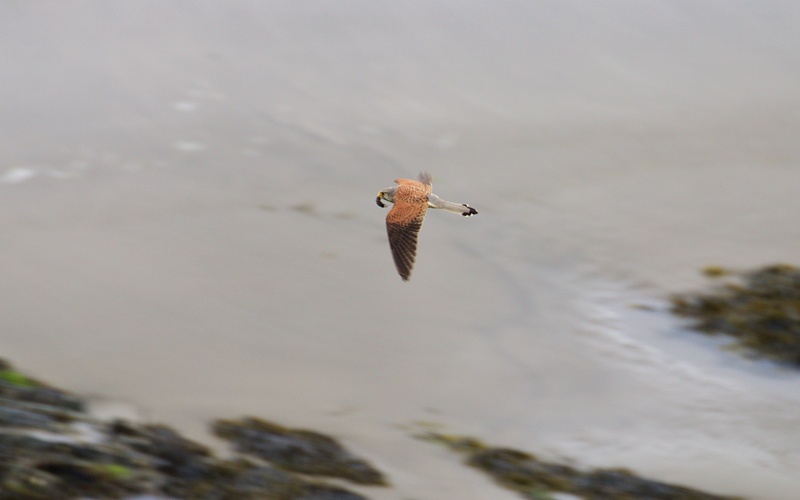 Male kestrel bringing in prey. A brood of whitethroats, not long out of their nest are catapulting around the brambles and honeysuckle, looking silly with their stumpy tails and yellow-fringed beaks. They have no fear and stare at us with as much interest as we them. 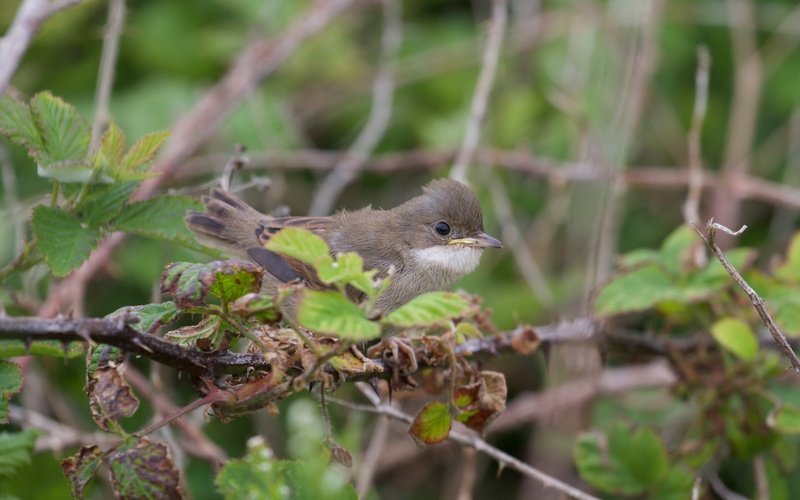 One of the young whitethroats in the bramble. 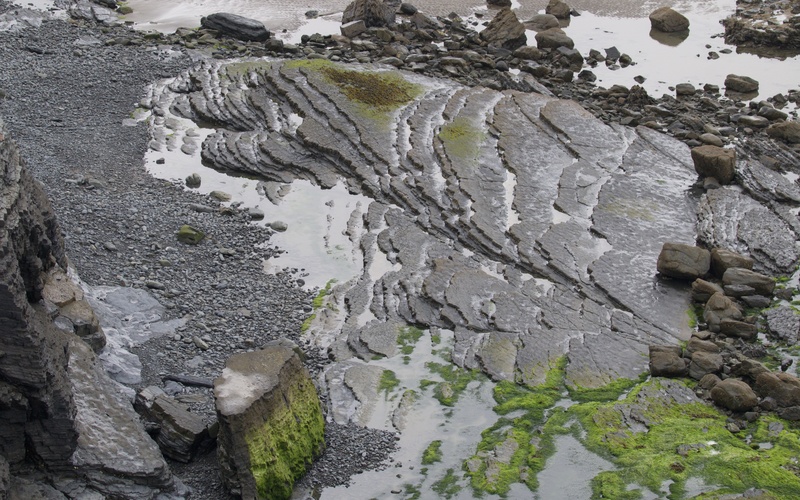 The rock art that is the Cambrian beach. 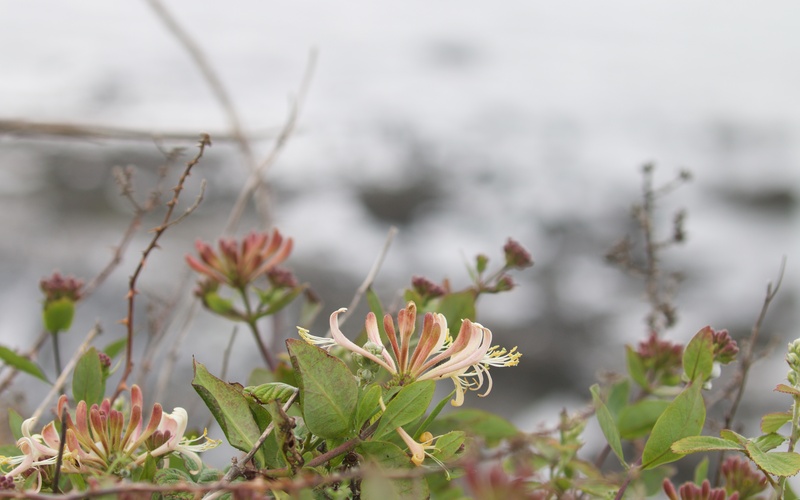 Coastal wildflowers: sheep’s-bit (Jasione montana) and honeysuckle (Lonicera periclymenum). 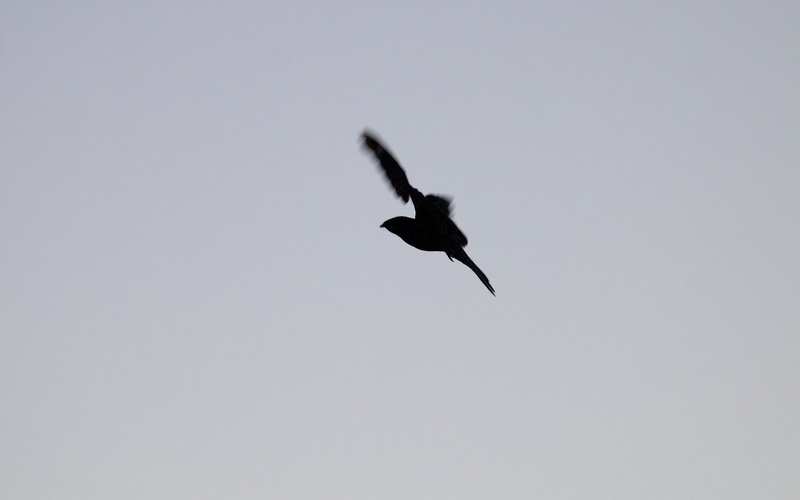 On the way back, the chough family rise from the turf and bumble about the sky above the fields; suddenly a peregrine falcon stoops in and pitches once, then again, at one of the young. The tiercel hangs over up the slope, perhaps waiting for the bird to break off and become isolated over the fields. 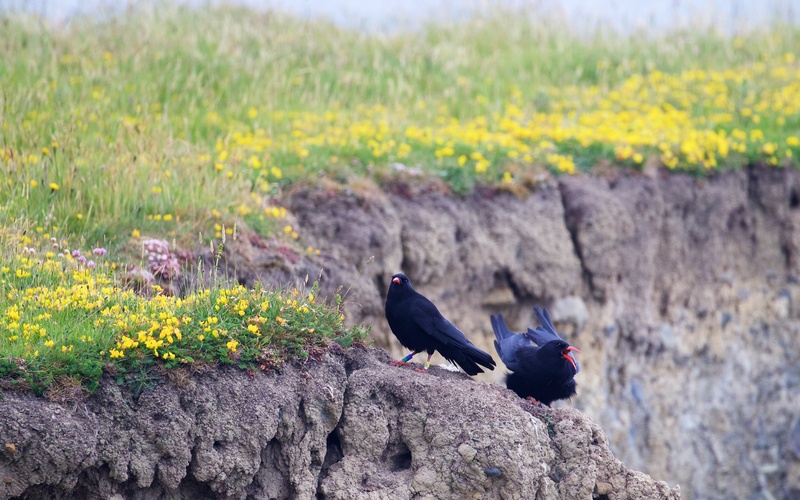 The choughs disperse in a wild panic; the chosen young chough smartly dashes for the cliff edge and tucks itself into a crevice. Tony reckons that the other two young, now absent from view, have rushed to their nest box to ride out the storm. The peregrines drift off with the nonchalance of well practiced, serial killers; the adult choughs fly over and perch and then over again, anxiously calling to the single young, perhaps enticing it to the nest box but the youngster is pressed firm to the rock and will not budge from its sanctuary. 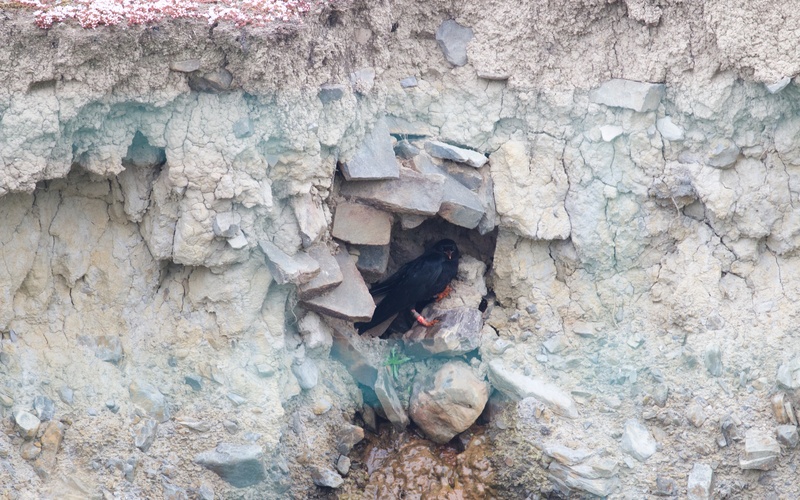 The anxious parents and the young chough huddled in a crevice and safe from the peregrines’ grasp. 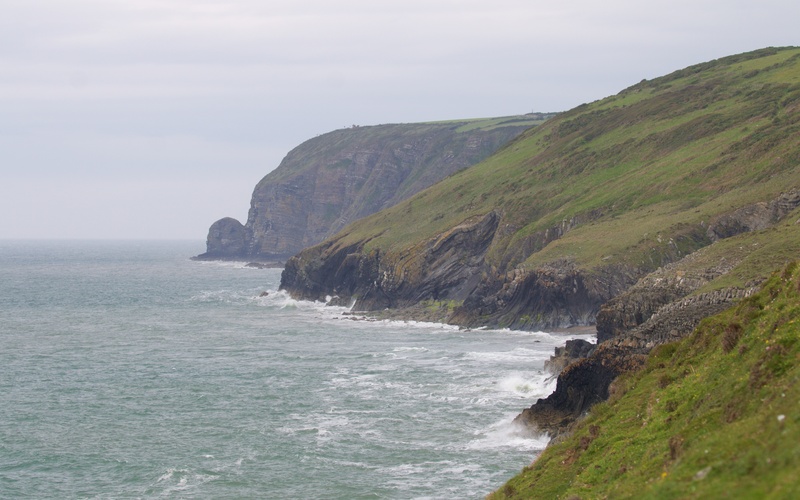 We leave the dramas of the hinterland, and head south to the coast beyond Newquay, and a chough nest with a single, late young somewhere on a ledge, deep in a sea cave. Tony does his circus act with a ladder down the cliffs and disappears from view. I huddle from the relentless wind watching the gulls wheel and twitch, chasing each other from virtual territories. After that, we head back north to ring another brood of kestrels on the coast north of Aberystwyth, dodging the incoming tide like schoolboys. The last job is the worst; Tony descends the wet grassy and steep slopes to ring an adult female on eggs way down on a low cliff. The sky closes grey and dead. I sit safe at the top with the dog and was pleased to head for home far inland, away from the relentless sea and suffocating mist. 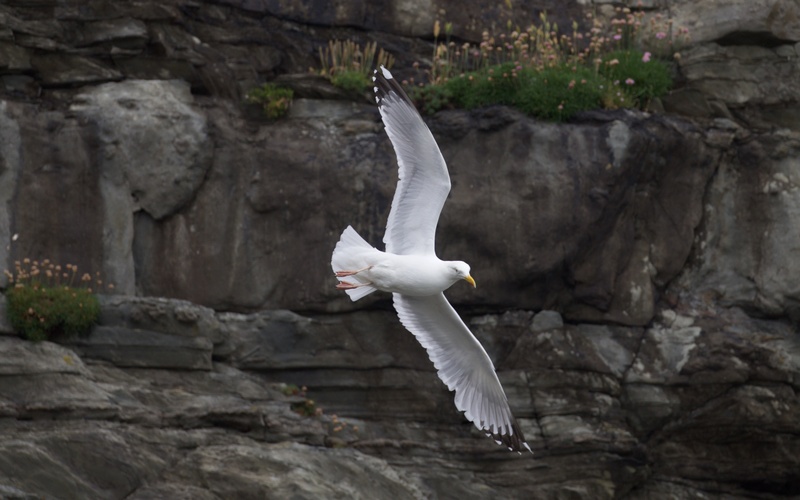 The coast south of Newquay and a hard-nosed herring gull protecting its turf. 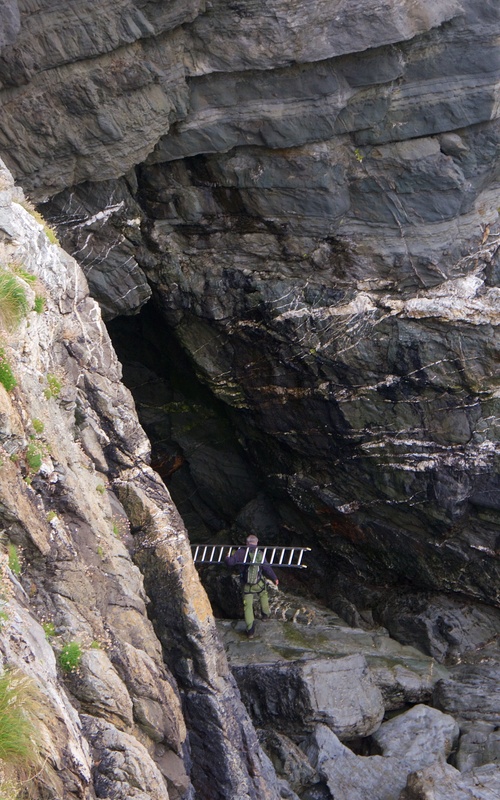 Fearless and supremely agile (or plain daft) chough ringer with ladder entering a sea cave having abseiled the cliff to the left and young herring gull nestled on much easier ground. The next day dawns bright and we drive east to check curlews and merlins in Shropshire, then nightjars in North Wales. First a few dipper nests on the Ithon, Teme and Ony. This should have been the Ony, Teme and Clun since they were all the quietest under the sun; second broods were just not be found at this late date. 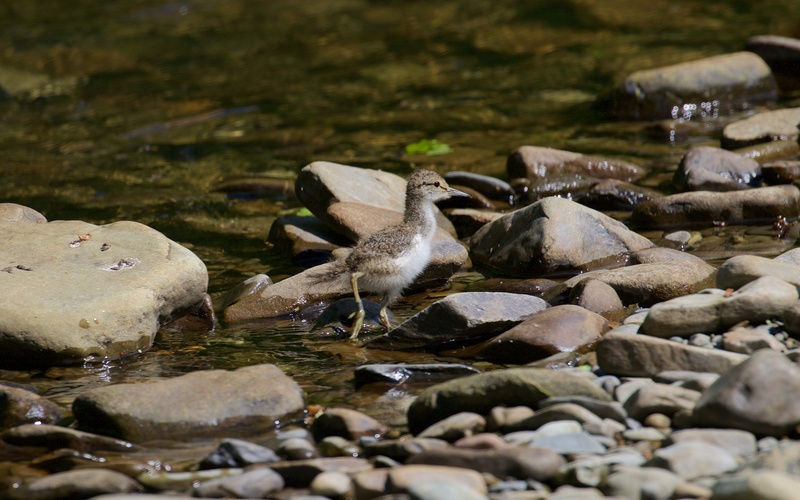 We hear and then see a pair of common sandpipers on the Ithon; these are now much rarer than 20 years ago. 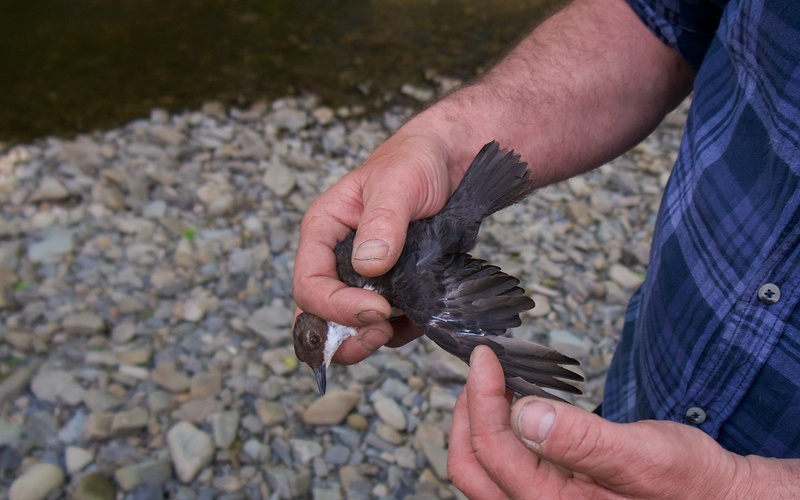 Tony puts up a net across the river and quickly catches the adults and a moulting dipper. Then the young begin to give themselves away with thin sandpipery calls from the vegetation that has grown up on the shingle bar; we hunt the sounds like foxes and chance on one and miss another as they run our gauntlet deep in the grass. 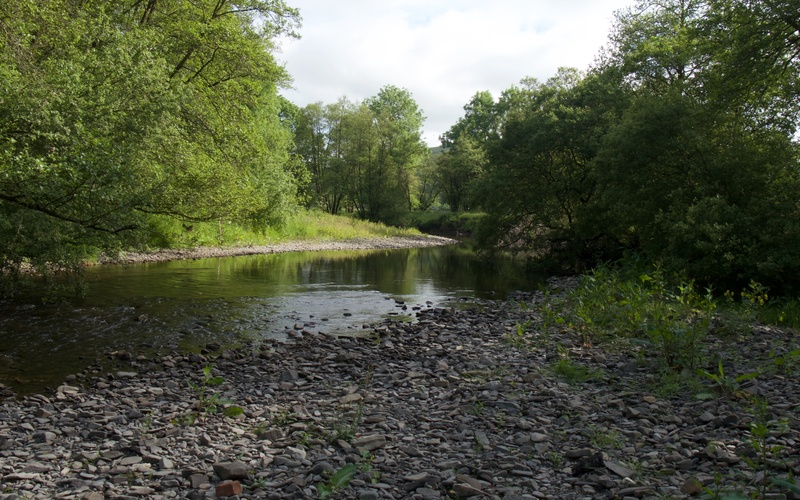 The river Ithon and an adult dipper almost flightless in its post-breeding moult. Young common sandpiper scampering away having been caught and ringed. We nip up the Long Mynd with Dave, a local watcher, and ring the only brood of merlins in Shropshire, and I reckon one of the very few in Britain that still nest in an old crow’s nest in a hawthorn tree. 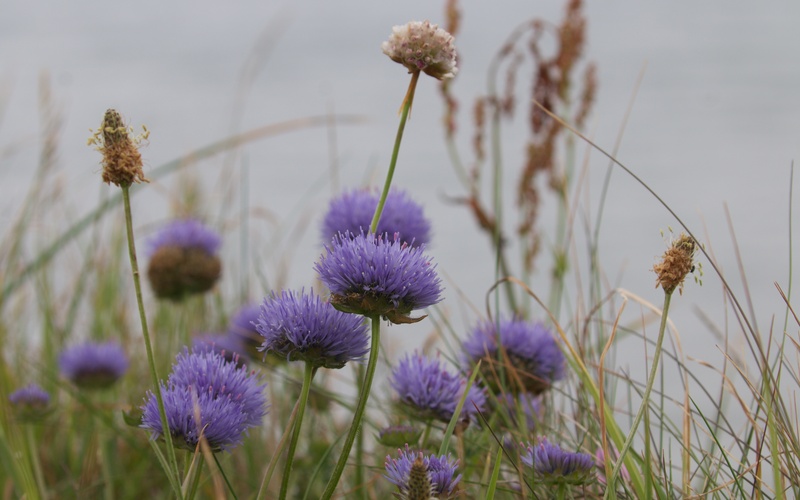 Most are either on the ground on keepered, grouse heavy, heather moors or in conifer plantations. This was a long, tiring walk but one that was also up and down memory lane, since I watched over a pair in a nearby valley in 1983 with another Dave and camped in an old barn on the top of the moor. Good old days with the RSPB. 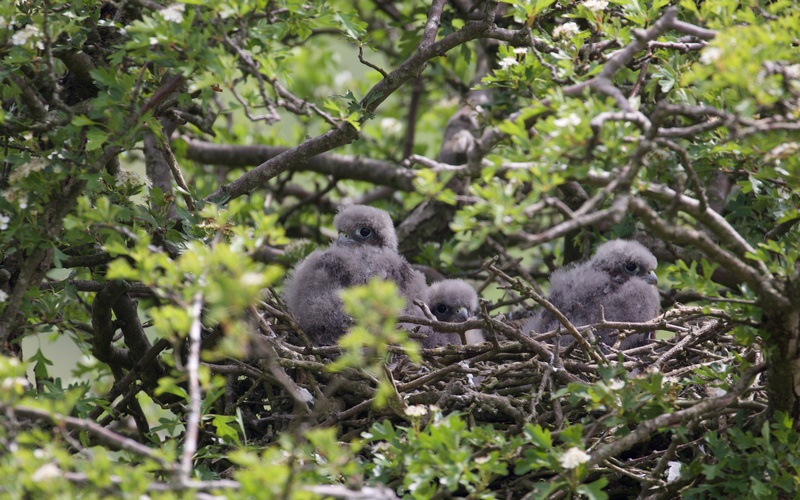 Three young merlins in an old crow nest sheltered within a hawthorn tree. The curlews around the Stiperstones in South Shropshire have been studied this year and nests located and monitored by Tony Most of the dozen or so pairs failed on eggs, probably scrumped on by foxes and badgers. Of three that hatched, only one brood of two is still ongoing; we check them easily because the young have tiny radio transmitters glued to their backs. They are gaining weight and look healthy. 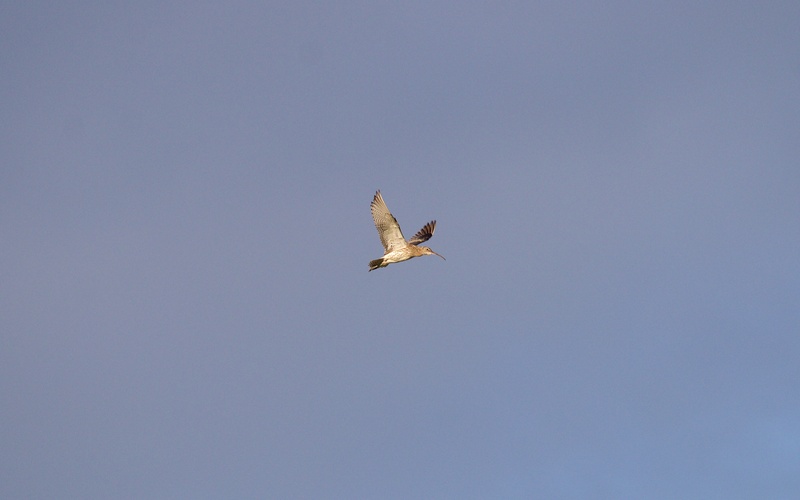 A single bird, most probably the male, keeps a guard from a safe distance and cries his distinctive, harsh curlew distress call as he circles and lands and circles again. This pair nested in the adjacent hay field and the adults immediately moved the young to a huge pasture field full of cows and calves. A few miles distant and curlews display and bubble on the flat pastures of a huge dairy farm. Forlorn sounds, since the pairs here failed long ago and have been joined by others that are likely to have suffered the same way. 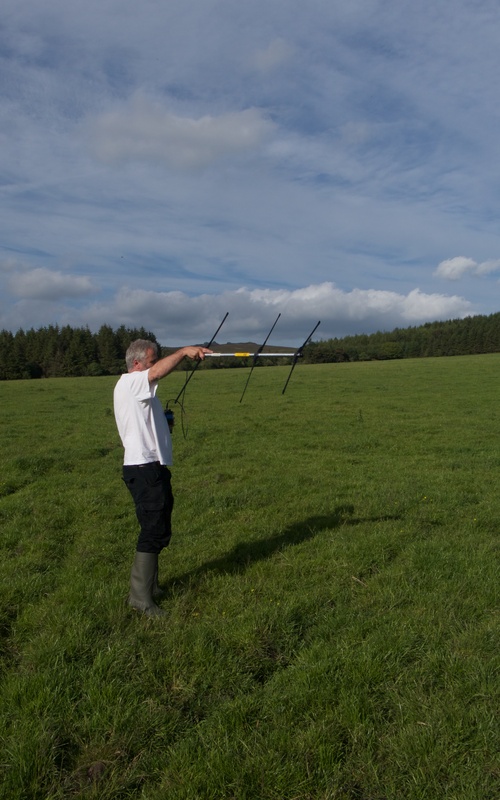 The research is in its first year and aims to gain a better understanding of why curlews are faring so badly and what practical measures farmers and ecologists can take to improve the sad statistics. A rare sight in Wales and the Marches: a young curlew. Note the radio tag and metal BTO ring. 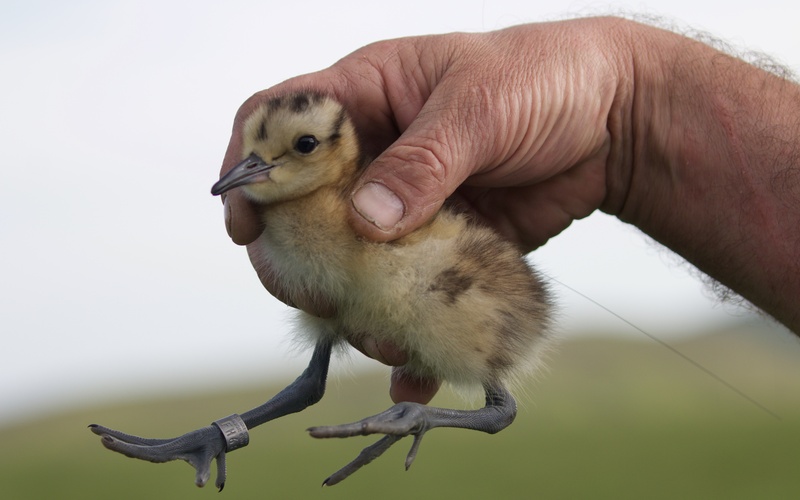 How to find a curlew chick. The late evening in the warm and still forest in North Wales is staggeringly successful. Three adults including a female are caught in nets using a tape to lure them in and one of the three is a female. The female incubates and broods the small young so that nearly always means a nest and most likely the second brood nest as well. Tony tags the tail in an delicate operation that requires dental floss and super-glue. 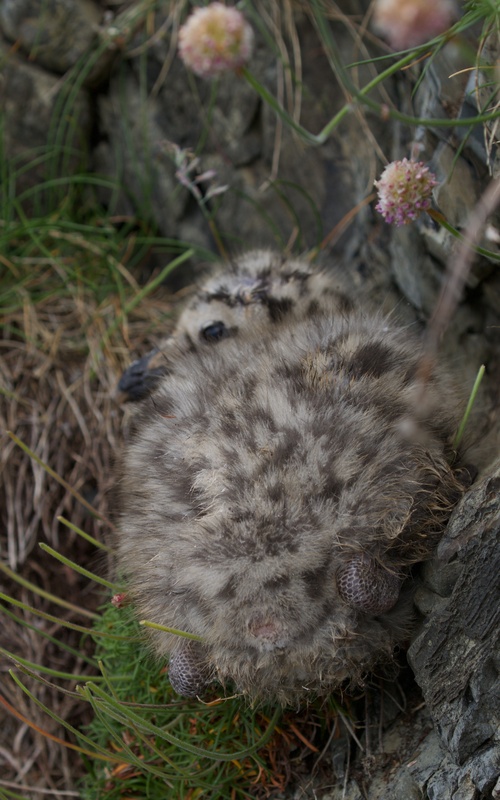 We locate the female the next day and she is sitting on two eggs deep in the young Sitka. We leave them be but will return soon to ruffle their beautifully camouflaged feathers once again. 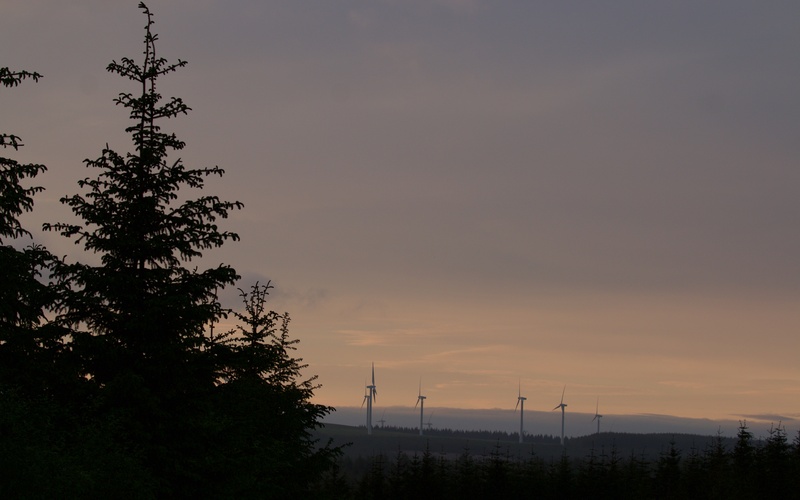 Forests of Sitka spruce and wind turbines; an alien world in which nightjars (as well as cuckoos, grasshopper warblers and many other bird species) appear to thrive. Male nightjar near the mist net. 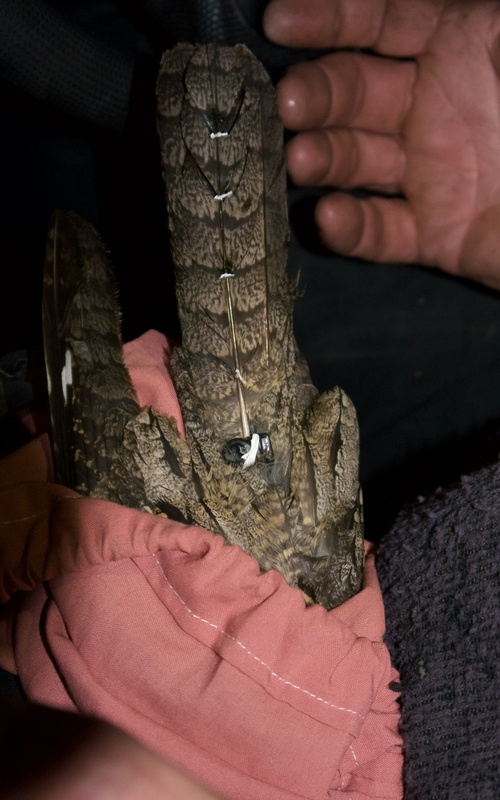 Applying a radio tag to a nightjar tail. Thank you for the kind words; I reckon the writing is much easier than the ringing.